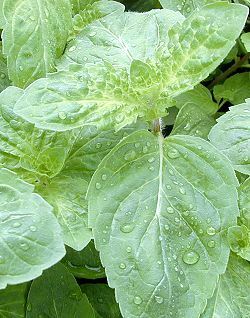 Lemon Bergamot Mint is a lovely citrus scented mint that can be used fresh or dried. Like all mints, Lemon Bergamot Mint, should be confined to a pot. Mints grow better in pots with lots of surface area rather than lots of depth. A long window box makes a good container at least for the first year. After that, your mint will need to be divided and repotted with fresh soil each spring. Lemon Bergamot Mint makes a great addition to our Gourmet Herb Garden Six Pack. This plant is sometimes available in plug trays. These trays hold 128 of all the same plant. They are a great low cost way to fill a lot of space. Each cell is 3/4 of inch by an inch. Check here to see if Lemon Bergamot Mint Plug Trays are available.